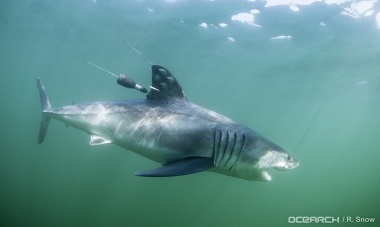 The scientists attached satellite and acoustic tags to ten sharks under a year old found swimming near Long Island. The tags monitored the locations of each shark and revealed that they spent several months in that area from August to October, probably because the shallower waters near the shore offer shelter from predators, including other sharks. The scientists also learned that the baby sharks headed south in late fall to shallow waters off the Carolinas. The sharks remained there for winter and returned to Long Island in the spring. The tags have now given the scientists a clear map of where these little sharks hang out, when and where they move and the routes they take. For white shark populations to recover from years of overfishing, baby sharks need to grow up and produce their own baby sharks. This information can aid in conservation efforts to ensure the babies of this vulnerable species reach full maturity.